Photo shot from the bedroom window. We just got back from a quickie vacation up to the cabin where we went kayaking for two days and did a thirteen mile hike up to a stunning alpine lake in between. The hike was a huge, HUGE triumph for me. I haven’t been up to this particular lake in about eight years because I got too fat and waddling over that much rocky trail made parts of my feet go numb. Enter Weight Watchers and minus fifty pounds later…voila! I made it….easily…and hiked all the way around the lake to boot. I became surprisingly emotional on the return trip, fighting back tears when it hit me that my hiking days weren’t over after all. I’d been schooling myself to let Alice Lake…and all the other beautiful, beloved wilderness places more than, say, three miles out…go, but it turns out I don’t have to now. Not yet anyway. Fat is evil. I can’t tell you how grateful I am to get it off again. But those days are gone and now the common practice is to allow wildfires to go ahead and burn in areas where they’re not threatening structures, roads, or lives. They often burn in remote areas for months on end until the first snowfall finally comes to put them out, with the forest service keeping an eye on them all the while, only stepping in to herd them a little if they start heading in a wayward direction. 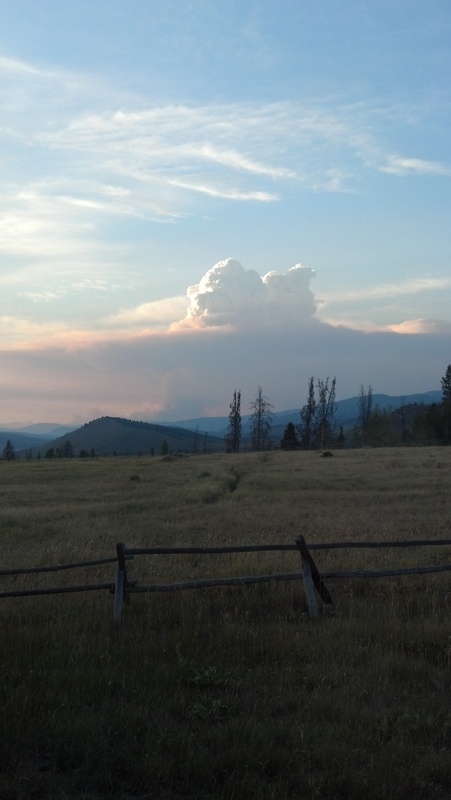 Two days before we arrived up at the cabin the Halstead wildfire flared up and grew really fast. 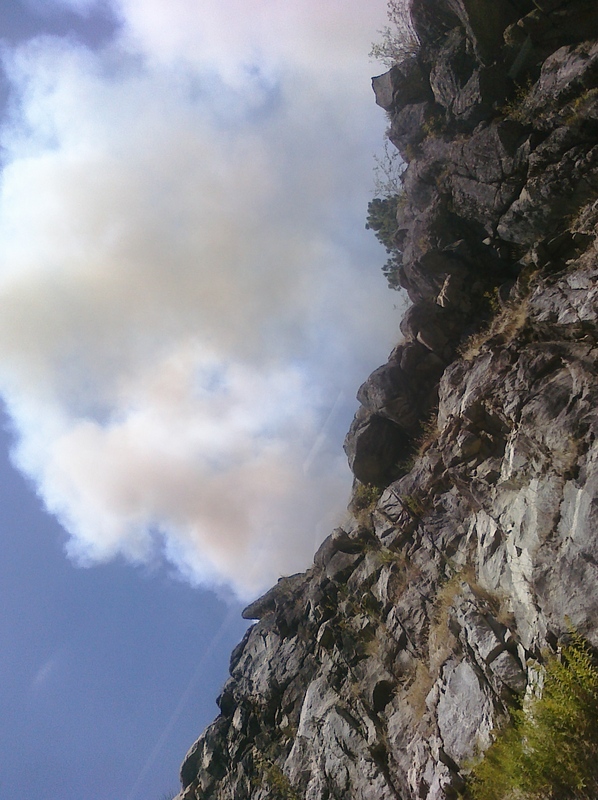 A cold front blew in Thursday evening and the winds that came with it were strong enough to increase the fire by 75% overnight. 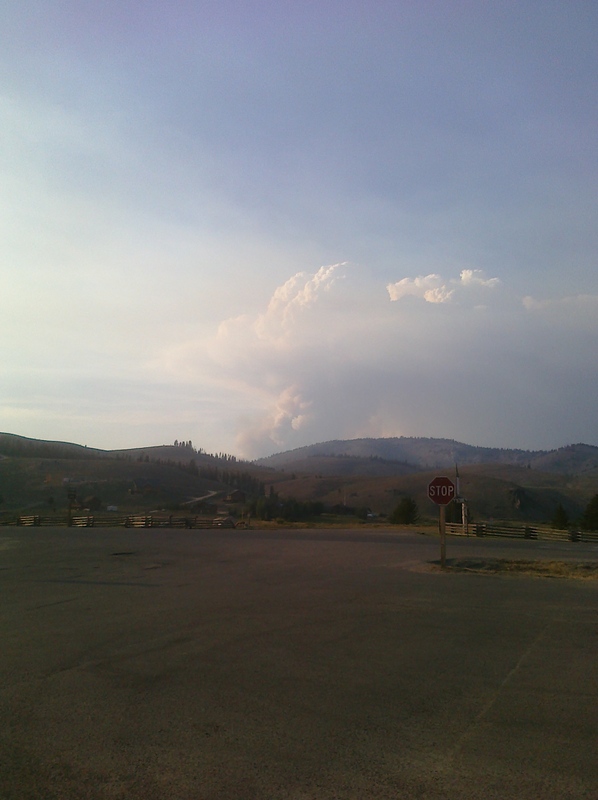 This is what it looked like from the town of Stanley on Sunday. 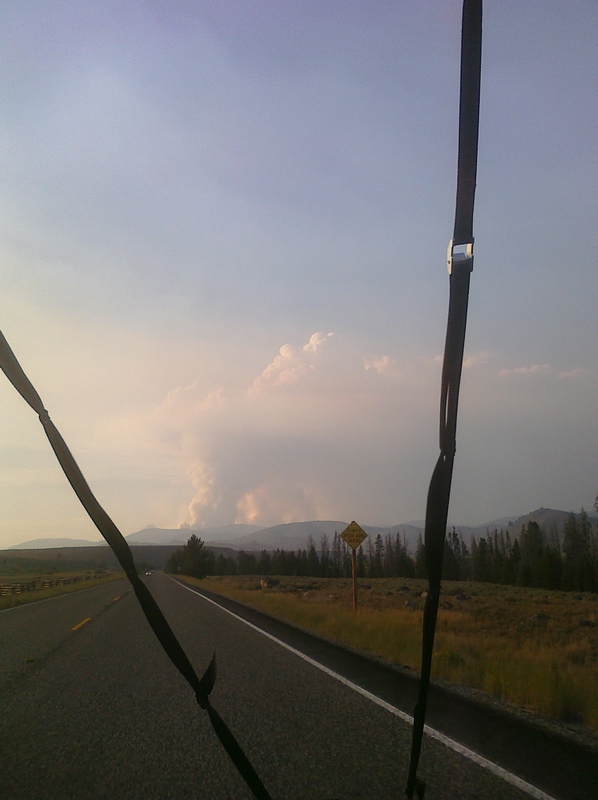 Wildfires tend to inhale during the day as temperatures heat up and you’ll often see this kind of mushroom shaped cloud forming above the areas where they’re burning the hottest. 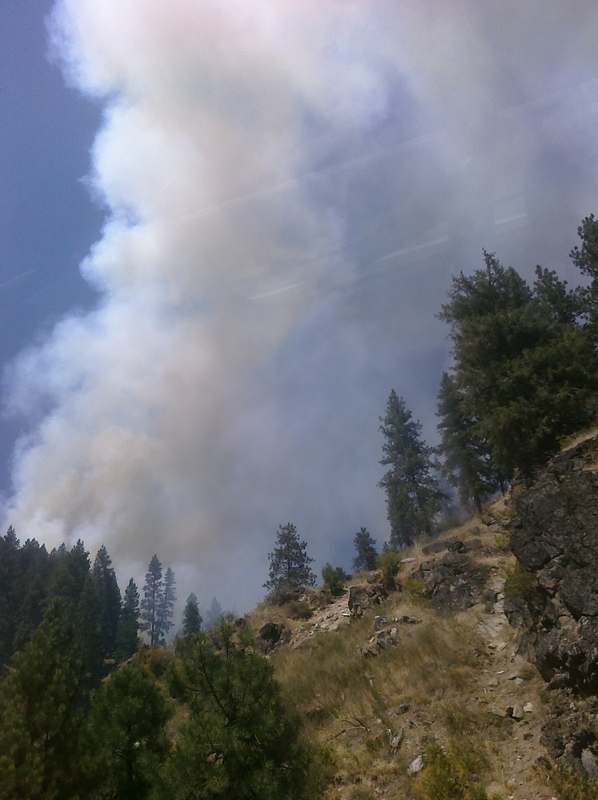 Wildfires can also generate their own winds and the big ones create firestorms that are incredibly dangerous for firefighters. 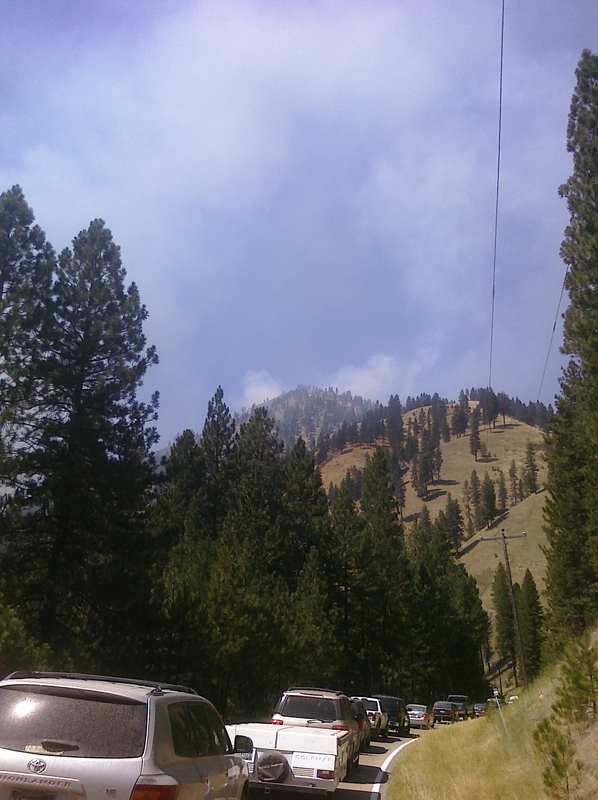 The Halstead Fire is one of those, which is part of the reason why they’re just letting it burn. Last I heard it had grown to about 22,000 acres or so, fueled by all the dry, brittle pine trees that have been killed off by the pine beetle infestation. 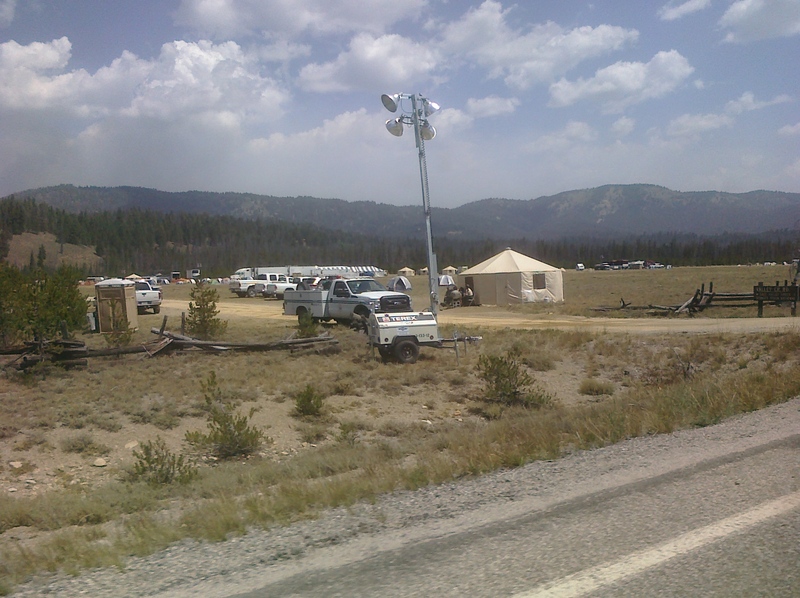 And below is part of the fire camp where headquarters have been set up for this particular wildfire. Each one gets its own local base of operations. 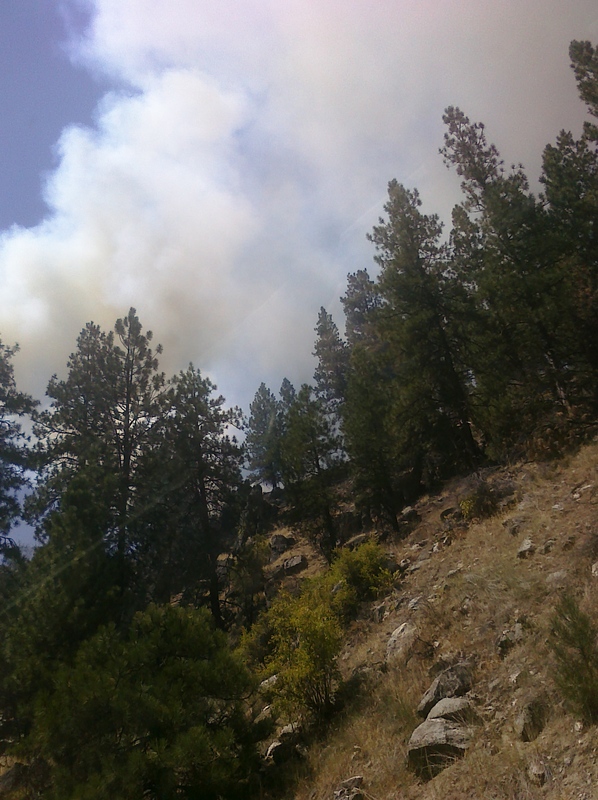 A couple hours of driving later and we just happened to stumble across the next wildfire that was started last night. 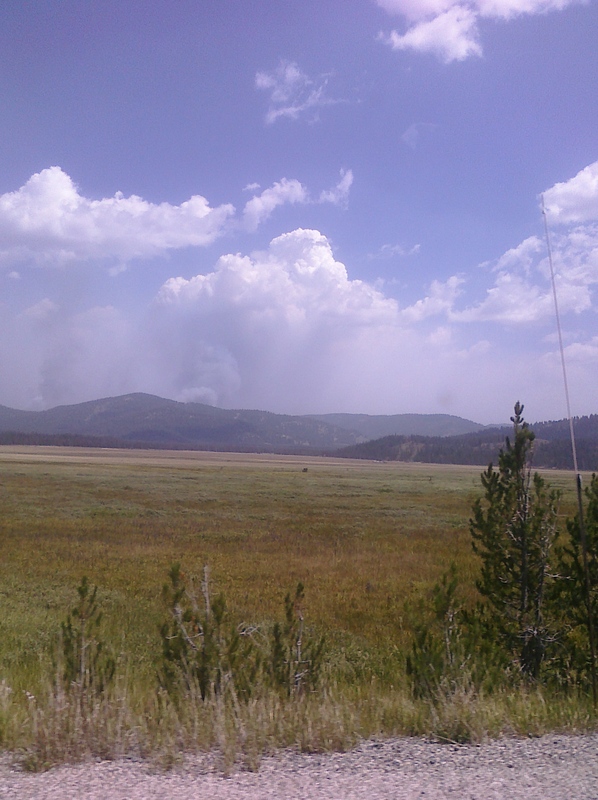 While the Halstead Fire was started by lightning, the Springs Fire (below) was human caused which is always disheartening. 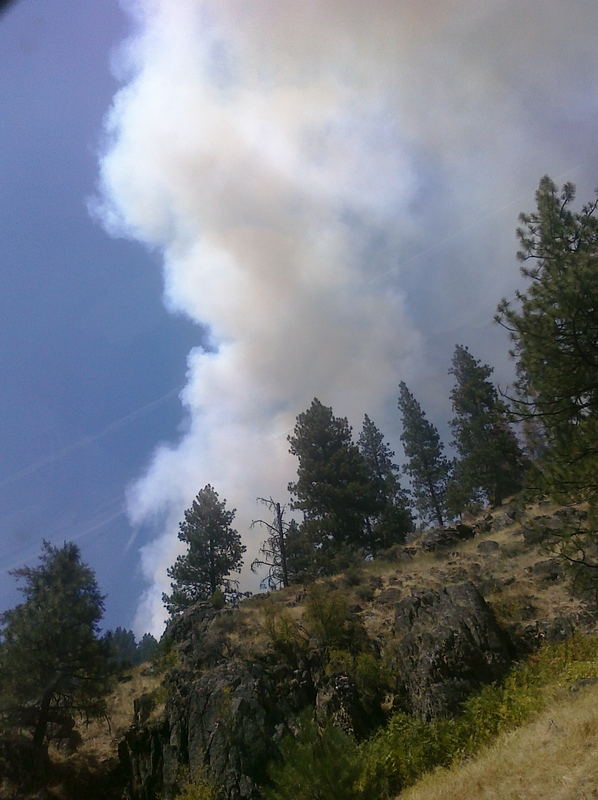 It seems to be burning near a local hot springs (locally known as the skinny dipper’s hot springs) that attracts a lot of people year round. Maybe one of them got stupid. It’s not that hard to do when things get this hot and dry. 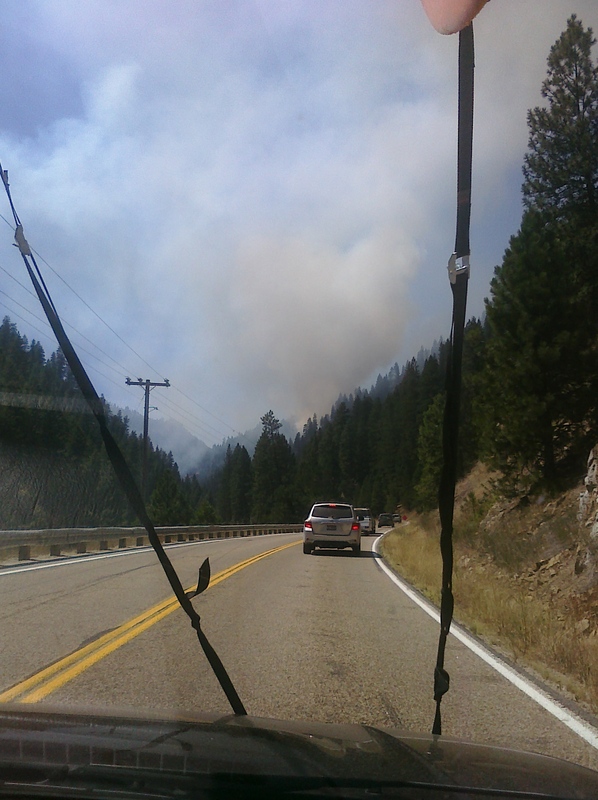 This fire is really close to the highway so traffic through the burn area was closed down to one lane. Here we are below in a line of cars waiting for our turn to drive through. You can see smoke from the fire up on the hill straight ahead. 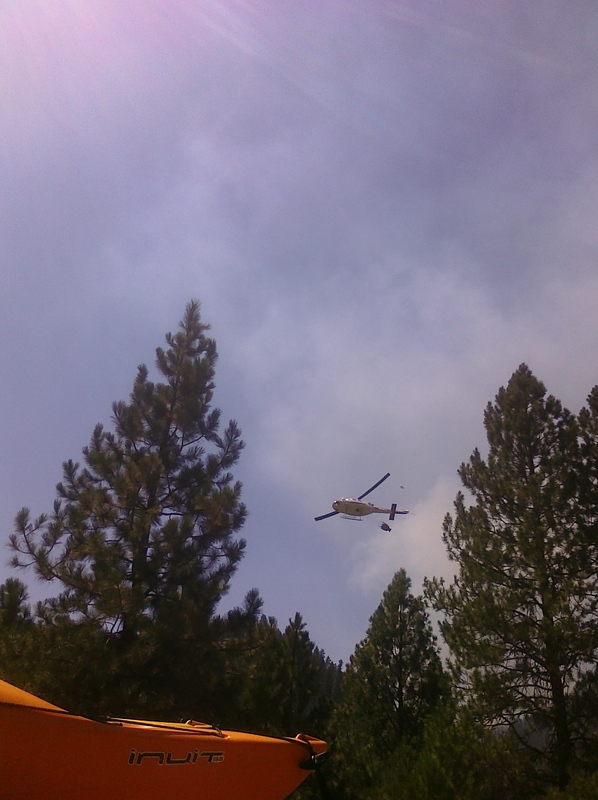 As we were waiting one of the helicopters fighting the fire flew almost directly over our heads, banked sharply in a U-turn, then flew down to the river just below us and scooped up some water in the bucket dangling underneath it. It was outrageously cool to watch. We passed the turn-out on the side of the highway where all the skinny dippers usually park only to find it now filled with emergency and fire fighting vehicles. (Photo below.) 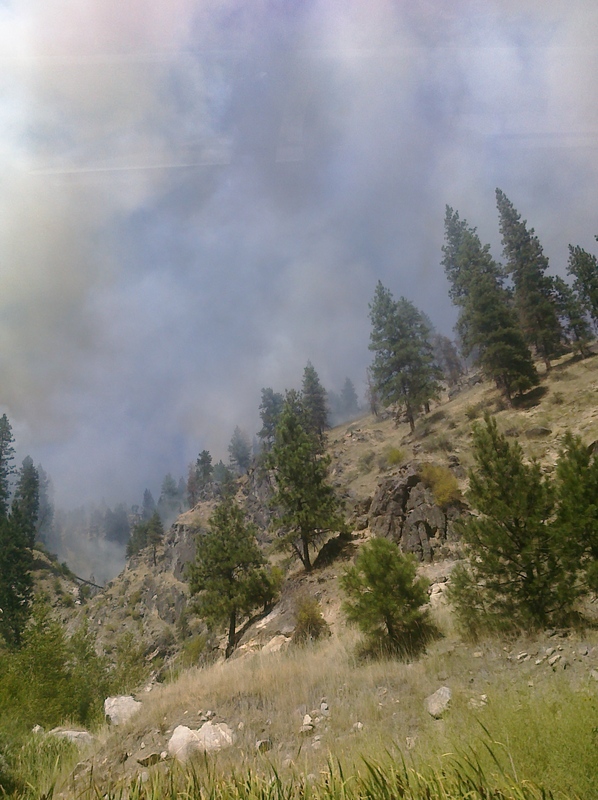 You can also see the helicopter again, in the center of the photo, flying near the fire. Look at the bucket. Tiny, no? It gives you an idea of what an enormous task it is to try and contain these things. Here are the rest of the pics I took as we drove through. I was pretty much just continuously snapping pics on my old, old cellphone so they’re not great. But hopefully it’ll give you an idea. And of course, no discussion of wildfire would be complete without some kind of reference to climate change. Long-time fire fighters were among the earliest converts to the notion that things are heating up, mainly because they see it up close and personal every year. The fires are getting bigger and burning hotter, regularly doing more damage and claiming more lives than they did in years past, and the brave people out there who are roping and riding these things in order to try and protect the rest of us are at greater and greater risk. Don’t drive over tall, dry vegetation. The underside of a vehicle gets very hot and will ignite it. If you smoke use a can with some water in it for an ashtray and put the spent match in there, too. If it’s windy, then please just don’t. Keep fireworks on the pavement in front of your house. Don’t take them out into the countryside. Sparks from chainsaws, welding torches, and other equipment are dangerous. Fires get started that way every year. And then there are campfires which should never, ever be left unattended: 1) use a fire ring. 2) have water and a shovel handy. 3) Don’t drop a match on the ground until it’s cold. 4) To put it out, pour water on the fire and stir until all the materials are cold to the bare touch, including any roots that might be running through the fire ring. (Fire can travel along roots and pop up in a completely different area.) 5) Obey any and all campfire bans. They’re issued when the risk of wildfire gets too high. Great photos! And also nice you got to enjoy some hiking and kayaking !! Oklahoma is having a time with the fires! I knew you guys were in a drought but didn’t realize there were fires out your way, too. Makes sense though. Be safe Becki! It’s true that the emergency responders have a better grasp on how quickly things are changing. I hope that shift comes quickly. Your weight loss is inspiring! I’m just today down 21 lbs. There were some agonizing plateaus, so it gives me hope knowing that real people (not just the ones on TV) can lose big numbers. Good on you Sweet! 21 pounds is a LOT. I know what you mean about plateaus…I’ve been stuck on one for about two months now and beginning to wonder if I should just give up on trying to lose the last five. I could just be where body wants to be now. There is a man in the meeting I often go to who’s lost over 100 so the big numbers are definitely real! I just heard about the young woman firefighter from Moscow who died today fighting a fire up in the northern part of the state. What a heartbreak…my heart goes out to her family and friends. Her loss was a shock to the entire community. Though I’d never met her, she was a friend of my co-workers daughter and her mother works in another division of UI Student Affairs. 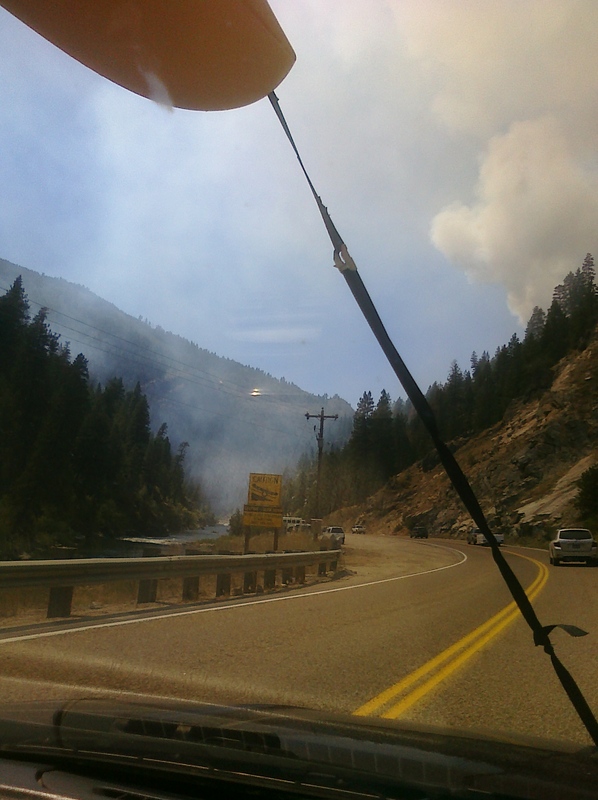 Wildfire-fighting is a common summer job for many of the students here. When the season is bad (as it is this year) they are given leave from school to continue protecting the rest of us. 50 pounds! Dia. Wow. What an accomplishment. Weight Watchers, eh? I’ll have to consider that. Things aren’t going at all well here. Alice and Toxoway are a couple of my favs. But I also love that Marsh Creek area where the fire camp is headquartered. I know fire is natural but my heart breaks at the destruction and images of Bambi flare before my child eyes, causing my skin to prickle with fear. 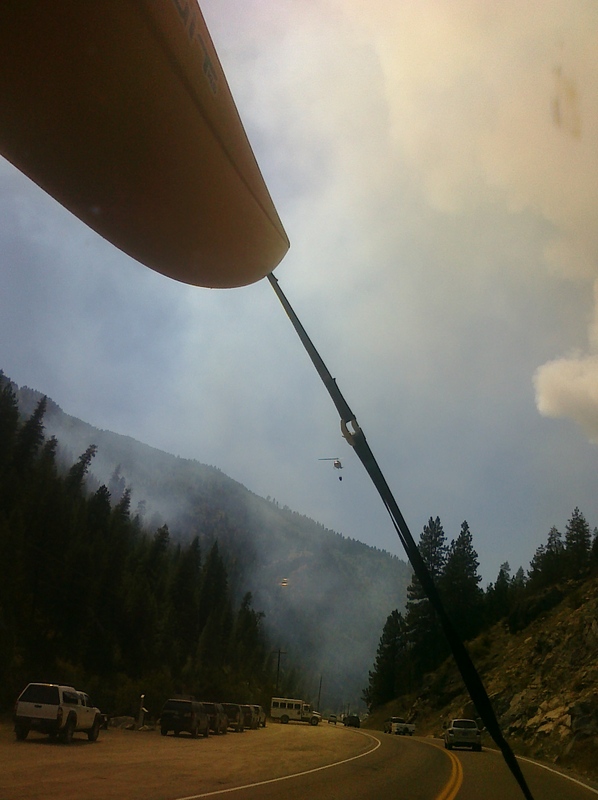 On time I was kayaking on the main and helicopters were bucketing water out of the river right in front of us. We had to take out and while I waited for the shuttle to pick me up I had quite a drama to watch as they made round after round with those buckets. The pilots are amazing.